1. At the outset, please accept my good wishes for a very happy, healthy and peaceful New Year. I pray that the year 2016 brings with it, renewed energy and enthusiasm to all of us and help us to perform our duties better for the progress and prosperity of our nation. 2. The year 2015, which is now behind us, was challenging. Even then, there were several positives. Our economy, which grew at 7.2 percent in the first half of 2015-16, is on way to recovery. Despite a dull trade performance, our external sector stability is intact. Current account deficit is a manageable 1.4 percent of GDP in the first half of the current financial year. Foreign exchange reserves are comfortable at over 350 billion US dollars. A worrisome feature is the agriculture sector which has been impacted by a deficient monsoon. Nature has not been very kind to us this year. Devastating floods occurred in different parts of the country, particularly Tamil Nadu and Assam, while several states reeled under severe drought conditions. To overcome these testing times, the Union and the State Governments have to work together. 3. In our parliamentary democracy, the Governors are the constitutional heads of their respective states. They must perform their duties and obligations within the framework of the Constitution. In other words, they must play their assigned role while respecting the distinct authority and responsibility vested in each of the three organs of the state, that is, the executive, the judiciary and the legislature. With their wisdom, experience and moral authority, they must help create a harmonious relationship between the Centre and the states. This will be in the best interest of the state and its people. 4. There are several important initiatives that have been taken by the Government of India to accelerate the progress of the nation and for enhancing the standard of living of the people. Prominent among them are Swachh Bharat Mission, Smart City Mission, Digital India, Make in India, Skilling India, and the Start-up India initiatives. Each of these programmes have a specific role in the making of a new India where there would be greater opportunities for its citizens especially the youth. 5. Though these flagship policies and programmes are to be primarily implemented by the executive under the leadership of the Chief Ministers, your astute leadership, power of persuasion and balancing influence can help in this transformative process. 6. You are the Visitors or Chancellors of several universities in your states. You can use this association to help create islands of academic excellence and motivate these institutions to become smart campuses. Through technology demonstration, they can also become the nucleus for inclusive development in their regions. You can impress upon these institutes to adopt at least five villages which they can help transform into model villages. They can also work in the areas of financial inclusion and digital inclusion in the adopted villages. Likewise, they can create robust models of cleanliness in these villages that can act as real examples for others. The Universities can also render technical expertise for the speedy implementation of the important Make in India programme. 7. You can take some initiatives in the Raj Bhavans also. You can convert Raj Bhavans into Smart Raj Bhavans. We have operationalized the ‘e-Way’ system for online dialogue and communication between the Rashtrapati Bhavan and the Raj Bhavans. You must make full use of this facility. You can ensure the digitalization of Raj Bhavans to make them technology demonstrators. You can open Raj Bhavans for public viewing just as we have done with the Rashtrapati Bhavan. 8. I had earlier pointed out the need to preserve and restore many of the Raj Bhavans which are heritage structures. 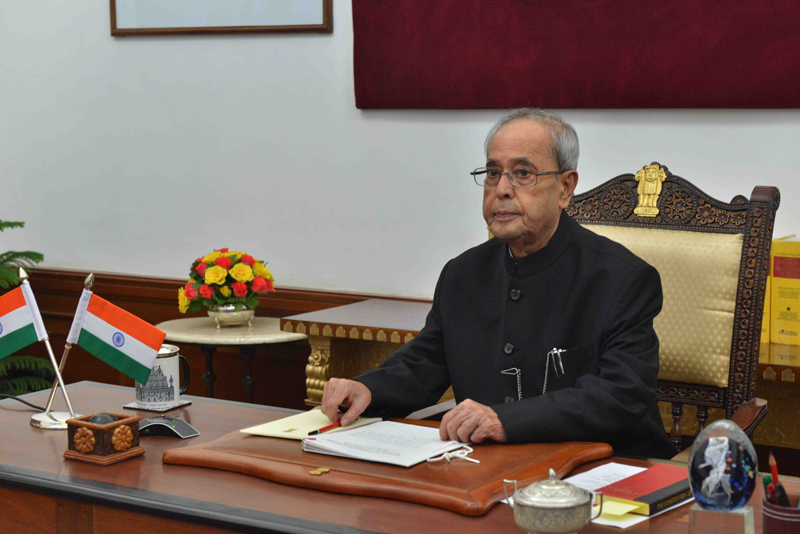 In the Rashtrapati Bhavan, we have made an attempt to create a Humane, Hi-Tech and Heritage township. All our activities have been geared to achieve the objectives of these 3-H’s. We have recently started a project to convert the President’s Estate into a smart township by rationalizing energy and water usage and waste management. The integrated approach through a command and control system will optimize the use of resources and provide efficient delivery of services to the residents. You too can initiate similar smart township programmes at your respective raj bhavans. 9. Let us all give our best to make 2016 the year of growth and transformation. In conclusion, I thank you for this opportunity to reach out to you and share my thoughts. I look forward to meeting you in the Conference of Governors next month where we would discuss the substantive issues.